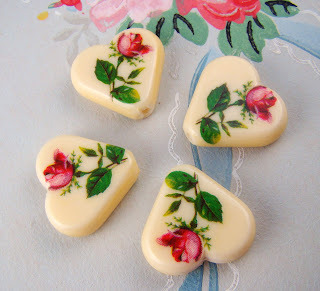 I love the hunt for wonderful, old vintage beads and have been lucky enough to find some wonderful vintage lucite, plastic and resin beads. 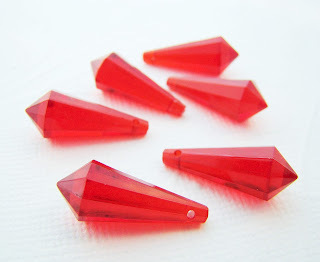 Vintage, West German faceted transparent ruby red lucite beads, drops with horizontal drilled hole, 20x8mm. New, uncirculated old stock. 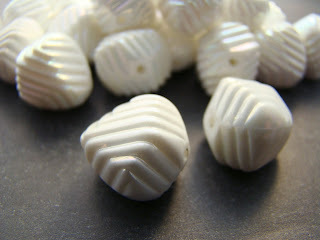 Retro chic, vintage 1950s beads are almost a cube shape with ribbed pattern, white aurora borealis finish. Beads are large, but leight weight.